Edenvale RiverWatch monitors water quality and habitat status of the upper Jukskei River. This includes the tributaries in Edenvale, Bedfordview, Modderfontein and Johannesburg suburbs. The focus is on the Modderfontein Stream and the Edenvale Stream (also called Eastleighspruit), the Glendower Stream and the Oriel Stream. 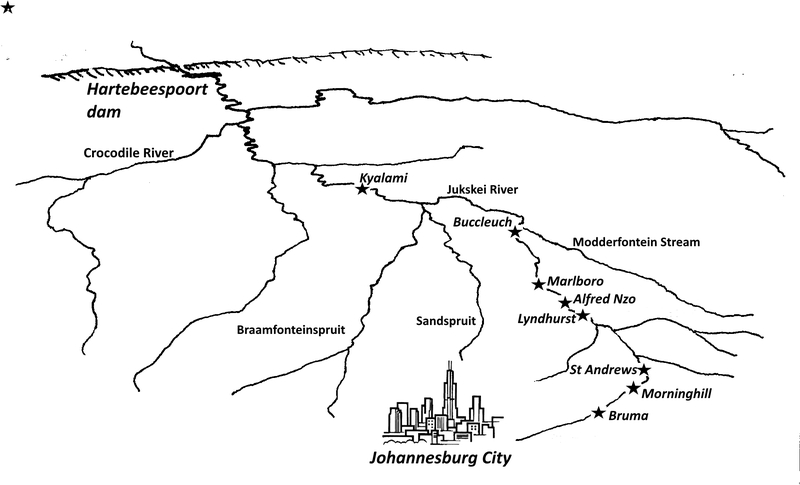 The map shows the upper Jukskei River catchment with the main tributaries. Edenvale RiverWatch uses official sources of water quality which are reported quarterly but are not always available. Edenvale RiverWatch may monitor daily in streams where pollution is a frequent problem. Monitoring is of two types: immediate and long term. Immediate monitoring is about water quality and pollution and records what is seen. It uses firstly a visual assessment of clarity, colour, foam, appearance and smell. Anyone who can see the river can assess the pollution with no special equipment and without touching the water. It can be completed and uploaded into a permanent database with a data upload app on a smartphone within a couple of minutes. Longer term trends require citizen science tools including turbidity measurements, bio-monitoring, flow measurements, habitat assessment and fixed point photo monitoring. Recent reports include analysis of the water quality reports from City of Johannesburg and Ekurhuleni Metro. The large sewage spill at Bruma in April 2017 is an example of how volunteer monitoring can find and report pollution, and also how changes to the river take place as it recovers. 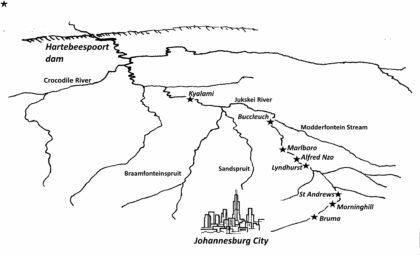 Start reading at More information on the Jukskei River. Silting up of the Modderfontein Dam 2001 to 2016. The upper Modderfontein Stream carries much silt which accumulates in the Modderfontein No 1 Dam, resulting in encroachment of reeds into previously open water. Founder’s Hill industrial pollution: The daily flow of pigmented pollution into the Modderfontein River is still not resolved as at April 2017. Recent video of Water Mongoose in Illiondale!